The 1976 Topps set is centered on one of the greatest running backs to ever play the game – Walter Payton. Payton’s lone rookie card is joined by fellow Hall of Famers like Randy White and Jack Lambert, but it is clearly the most valuable card in the set. In fact, in PSA Gem Mint 10, the Payton rookie has sold for nearly $14,000 at auction in recent times. In the next article, we break down this 528-card set that remains popular with collectors today. The 1967 Topps football set is one that really captures the emerging culture at the time. The design, which has a psychedelic feel to it, seems to embrace the hippie style. The 132-card set does not contain a host of key rookie cards like other issues from the period do, however, it does contain stars like Joe Namath and a condition-sensitive card in #131 – Leslie Duncan. In the following article, we take a look at this eye-appealing set and talk to the collectors who chase it. In basketball, and other sports, the coach’s job is to not only lead and direct a team to victory, it is also to drive, to inspire and to motivate. This collection is a tribute to some of the finest NBA coaches who did all of that, and more. 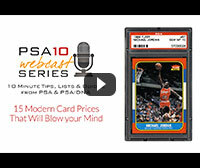 Names like William Holzman, Len Wilkins and Phil Jackson are just a part of this 13-card set. At 100% complete and with a current set rating of 8.92, this collector’s set has remained in the #1 spot for 3 years running, earning a Best of the Registry award each year. Click here to view this collection. Clean Sweep’s latest auction opens up with a truly exciting card, the only Mint 9 example of the 1958 Topps Herrer(a) error. The card has been in the possession of our consignor for 20 years, and was just recently slabbed at the National Convention in Cleveland. A true 1/1, highest graded card. Showcasing an eclectic and enticing mixture of sports, Hollywood, history and rock rarities, Iconic Auctions’ Autographs & Memorabilia Auction is set to close this Saturday, September 20th. Lots for this sale can be viewed and bid on by going to the company’s website, www.IconicAuctions.com. REA Blockbuster Fall Auction Mails September 26! Beginning October 1, the company will offer more than 1300 lots in their highly-anticipated fall catalog auction, the second such event added to their calendar, which previously consisted of only a spring sale. The auction closing date is October 18. There are 850 lots for auction that will end on Thursday, September 18, 2014 at 11 PM EST using the 15 minute rule. This auction features many high grade and low pop cards for collectors to complete their sets from the 1950’s through the 2000’s. The 1961 Topps set break in PSA 8, 9 and 10 continues. There is a nice group of 1972 Topps Hockey with many PSA 10s. PSA Authorized Dealer Steve Novella (Estero, FL.) will be breaking a 1962 Topps Baseball PSA Graded Set card by card on eBay. Set Break features nearly 400 cards grading PSA 8 and one group lot of cards grading PSA 7. The auction will be featured as all Mile High Card Co. auctions are on the company’s website at www.milehighcardco.com and will close utilizing the standard 15minute rule at 9:00 PM EST on the 24th of September. "Extra Innings" auctions are Mile High Card Company’s online only auctions and offer collectors a bevy of material from graded cards, to complete sets, autographed material, memorabilia, and everything else from all four major sports. In your opinion, which of the following NFL players will make the biggest hobby impact this season?